A long, long winter has kept the red, red robin from doing much bob-bob-bobbin’ so far this year so Baltimore’s Downtown Partnership is going to ring in Spring. To wit: Downtown Partnership presents the annual Spring Egg Hunt featuring Cowboy Barry’s Petting Zoo. Baltimore tikes can enjoy the outdoor chalk station and the petting zoo with chickens, piglets and bunnies from 11am-1pm. 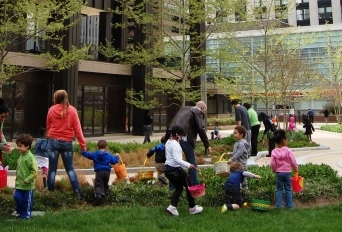 The egg hunt will begin promptly at 11:30am, April 17th, with hundreds of eggs hidden all around the lush gardens of Center Plaza. Make sure to bring a basket or bag for the egg hunt. Goodies and giveaways will be provided for children. Center Plaza is located along Charles and Fayette Street, and also has entrances along Liberty Street. Parking is located along Liberty street, and the Circulator Purple Line stop is just across the street at the corner of Charles & Fayette Street. Last year, over 200 hundreds families and children enjoyed this outdoor lunchtime playdate. This year, we look forward to spending our spring playdate with you and your family. ← Share your taste. Your vote counts.